The world was shocked when Donald Trump was elected President of the United States in 2016. That a racist, homophobic, misogynistic candidate could become arguably the most powerful person in the world heralded exceptionally dangerous times ahead. In a ComRes/The Independent poll, 66% of British people thought he would make the world a more dangerous place. Those people were right. As we pull back from the nuclear brink one week, we veer closer to it the next. This seems to be the new normal under Trump; simultaneously a bringer of peace to East Asia and harbinger of war in the Middle East. His presidency has ushered in a new era of militarism where the risk of nuclear confrontation and war is increased. The Bulletin of the Atomic Scientists moved the hands on their Doomsday clock last year to two minutes to midnight, the joint closest since 1953 – and it has remained there in 2019. In 2018 they cited nuclear risk, climate change and emerging technologies as the key drivers for catastrophe. This year they have raised major concerns about the undermining of democracy through information warfare. The dynamic in world politics that seems to be inexorably leading towards greater global tension, conflict and war, is being exacerbated by these developments. Given the increasing possibility that a war could become nuclear, it becomes a vision too terrible to contemplate. Trump’s behaviour since his inauguration has angered and galvanised campaigners on a wide range of subjects. For CND there are very specific dangers of which we need to be aware. It is horrifying that an apparently volatile man with a track-record of acting impulsively and little detailed grasp of the implications of nuclear use has access to the nuclear codes. There are also great dangers to world peace from his views on the US nuclear arsenal, nuclear proliferation and multilateral agreements. In uncertain times the last thing anyone needs is the most powerful man on earth kicking off a new nuclear arms race. But that’s exactly what then president-elect Trump did in 2016, tweeting that ‘the United States must greatly strengthen and expand its nuclear capability until such time as the world comes to its senses regarding nukes’. President Trump expanded on this in 2017 in his first comments on the US nuclear arsenal since taking office. He said that the US ‘had fallen behind on nuclear weapon capacity’ , despite the US already having 7,300 nuclear warheads, with plans to spend over $350 billion over the next decade modernising and maintaining them. While Trump did say he would like to see ‘nobody have nukes’, he went on to state ‘we’re never going to fall behind on nuclear power… we’re going to be at the top of the pack’. The US nuclear weapons are many times the size of the bomb dropped on Hiroshima, so the US already has the capacity to destroy all life on earth. What conceivable reason could Trump possibly have for wanting to increase the US arsenal? Indeed, Trump’s ignorance about nuclear matters and his seemingly cavalier approach to their use is extremely alarming given that he now has his finger on the nuclear button. The new US nuclear posture review, published in February 2018, develops this framework and makes nuclear war more likely. It takes the lid off the restraints on both new-build and nuclear weapons use. The most significant element of the review is commitment to a whole new generation of nuclear weapons, with the emphasis on low-yield, often described as ‘usable’, nuclear weapons. It should be pointed out here that the bombs used at Hiroshima and Nagasaki are technically low-yield in today’s parlance, so we are not talking about something small. This goes hand-in-hand with the recently announced $1.2 trillion programme for nuclear weapons ‘modernization’. Trump officially withdrew the US from the historic Intermediate-range Nuclear Force (INF) Treaty with Russia in February 2019. The INF Treaty was signed by US President Ronald Reagan and Soviet President Mikhail Gorbachev in 1987. It banned the US and the Soviet Union (subsequently Russia) from possessing ground-launched nuclear missiles with ranges from 500km to 5,500km. Since it has come into force, this treaty has ensured the destruction of nearly 2,700 short- and medium-range missiles and played a crucial role in ending the Cold War. It is because of the INF that cruise missiles, SS20s and other such missiles were removed from Britain and across Europe, ensuring that neither superpower could conduct a nuclear war in Europe. This is likely to result in a new nuclear arms race between the US and Russia, threatening our global security at a time when we are already facing heightened international tension. If the US reintroduces intermediate-range missiles it will attempt to place them in Europe – most likely the UK. This will put us on the front line in the event of a nuclear war between the US and Russia. The UK government should be joining other European leaders in voicing strong opposition to the US’s withdrawal from this treaty and making a clear statement it will not accept US nuclear missiles on British soil. While Trump has attacked the nuclear deal with Iran, saying ‘it’s one of the worst deals ever made’ , this agreement was a huge achievement which came about after a decade of talks. Iran has accepted restrictions on its use of nuclear technology in return for the easing of economic sanctions. But in May 2018, Trump withdrew the US from the deal in a dangerous and irresponsible move, rightly condemned by the international community. The ground-breaking 2015 deal achieved its central aim: Iran doesn’t have a nuclear weapons programme. Only a president hellbent on making the world a more dangerous place would consider such a belligerent and counterproductive move as to jeopardise this agreement. And then in October 2018, the US announced the ‘toughest ever’ sanctions on Iran, reinstating economic measures on oil, banking and shipping that were removed through the deal. Although fresh sanctions were expected, the severity of the sanctions indicates Trump’s determination to ramp up US confrontation with Iran. Iran is likely to interpret the sanctions as an offensive measure, and it’s within this context that Tehran may now lose faith in the deal, despite the reassurances of the other signatories. The loss of confidence in the deal may not be immediate, but if sanctions are damaging it may be a matter of when rather than if. The collapse of diplomacy and the threat of military intervention could see Iran conclude that a nuclear weapons system is now needed. And if Iran is pushed down the road to nuclear weapons, it potentially opens the door to Egypt and Saudi Arabia going down the nuclear route as well. At the beginning of 2018, the Korean peninsula stood on the brink of a war that threatened to turn nuclear. The danger of nuclear conflict between the United States and North Korea was increasing as both sides exchanged belligerent rhetoric. But a peace summit between North Korean leader Chairman Kim Jong-un and Trump in Singapore in June 2018 was a positive development, although we are yet to see concrete steps towards disarmament. A further summit will now take place in February 2019. Casting a shadow on potential developments however is the US’ withdrawal from the Iran deal. What faith can leaders now place in Washington’s involvement in peace deals when they see such a clear example of a US president not fulfilling his country’s agreed obligations? Recent policy documents indicate preparation for high-tech massively violent wars against Russia and China. Trump’s new defence strategy states that the US will compete for dominance against its long-term strategic competitors – Russia and China – now designated as ‘revisionist powers’ that wish to reshape the world consistent with their ‘authoritarian model’. ‘Rogue regimes’ are still a focus for concern but the ‘war on terror’ is downgraded – no longer the central military priority. The new approach shifts the big picture focus away from the Middle East and extends former President Obama’s focus on China to encompass the entire Eurasian landmass, with the emphasis now away from asymmetrical warfare with non-state actors to war with major powers. The United States already has a missile defence system – now integrated as part of the NATO Ballistic Missile Defence network – which is making the world a more dangerous place by leading the world into a new arms race. The US missile defence system is made up of a series of ground based radar, command and missile interceptor bases around the world. They are supported by satellite and sea-based facilities, designed to detect and shoot down incoming missiles. Trump announced a new missile defence policy in January 2019, one which leads us closer to the militarisation of space. The new Missile Defence Review details the development of new technologies, including a space-based layer of sensors as part of an enhanced missile defence system. The US and NATO are already surrounding Russia and China with missile defence and other military installations which are continually upgraded and moved closer to their borders, surrounding them and threatening their territories. Specifically referring to America’s perception of threats from these countries, Trump’s new missile defence policy calls for major upgrades to a pre-existing land and sea-based interceptor system, as well as a layer of satellites capable of tracking new cruise or hypersonic missiles from other nations. The US administration announced in 2017 that its THAAD missile defence system in South Korea was operational, though not currently operating at full capability. As well as incurring protests from local residents who fear the weapon could make them a target, China and Russia are also concerned that the system could impact their nuclear capabilities. The move looks set to further antagonise the US and its allies’ relations in the region. Missile defence does nothing to encourage international understanding and cooperation. It is actually offensive, expensive, destabilising and extremely dangerous. The North Atlantic Treaty Organisation (NATO) is a nuclear-armed military alliance which is an obstacle to a peaceful world and global nuclear disarmament. It currently comprises 28 member states, including the United Kingdom and United States. NATO was first established during the Cold War, and since its inception has expanded both its sphere of influence and the scope of its activity, destabilising international relationships as it does so. Trump has expressed scepticism about the benefit of NATO to the United States while also attacking the level of defence spending by fellow members of the alliance. Trump threw the 2018 NATO summit in Brussels into disarray with a surprise demand for countries to raise their defence spending to 4% of GDP. The current NATO target for defence spending is 2% of GDP. NATO nor Trump should be in a position to impose spending ‘guidelines’ on independent nations, which should be determining their own funding priorities based on genuine need. The UK – as well as other nations – should determine its level of defence spending based on what is necessary for Britain’s security. Since coming into office, Trump has shown nothing but contempt for working collaboratively with the international community. In June 2018, the US administration pulled out of the United Nation’s Human Rights Council, the latest in a long line of withdrawals, including the Paris climate agreement (where the US is the only country in the world who is not a signatory). The Trump administration has also confirmed it wants to cut the amount of money it gives to the United Nations by more than half. The UN, as well as international diplomats, have warned that this would have a disastrous effect, including on UN peacekeeping missions, which are currently protecting lives and infrastructure in countries including South Sudan, Haiti and Cyprus. Politicians in the US have previously complained that the US contribution (22% of the total UN budget and 29% of peacekeeping operation costs) was disproportionate. Japan pays a further 10%, then China, Germany, France and the UK all pay about 4.5% of the budget, with the rest distributed among other states. Peacekeeping not only saves lives but ensures countries don’t collapse, creating even more chaos on the international stage. It can only be hoped that Trump does not endanger the nuclear Non-Proliferation Treaty (NPT), which came into force in 1970. Of course there are major flaws with the treaty, most pressing that it hasn’t been able to bring about nuclear disarmament. But it is an indication of what is expected of the international community and a bench mark which is aimed for: a world without nuclear weapons. 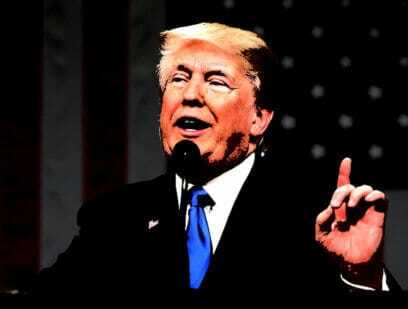 Trump made another highly controversial announcement in June 2018: he has directed the Pentagon to develop a ‘Space Force’ – a new branch of the US military, ‘separate but equal’ to the US Air Force – to ensure ‘American dominance in space’. The idea of a sixth branch of the US armed forces to deal with space is not new, but Donald Trump seems determined to push for it to please his supporters, his ego and parts of the military-industrial complex. The US has already spent billions of dollars on militarising space – on satellites, ground-based stations and new technologies such as armed drones, controlled through satellites. The US military (and that of other states) has become almost totally dependent on space technology. While the US Congress would need to approve its creation, a new Space Force is due to be in place by 2020, at an as yet unknown cost which is expected to run into the tens of billions of dollars. When Trump visited the UK in July 2018, hundreds of thousands protested in the streets. The demonstration was a remarkable upsurge of popular feeling against his policies. It was a powerful rejection of the extraordinary human, social and economic damage being inflicted across the USA – and the consequences of these developments elsewhere in the world. His presence in the White House means open season for racism, homophobia and misogyny. The support and succour that he brings to the far right internationally is enormously dangerous; this is a political development that must be challenged at every level. Trump has brought into sharp focus the very dangerous aspects of Britain’s relationship with the United States. For 60 years we have been tied into a special nuclear relationship with the US through the US-UK Mutual Defence Agreement, the world’s most extensive nuclear sharing agreement. It is now more urgent than ever for the government to end this relationship. Maintaining it gives active support to Trump’s policies and draws us into Trump’s nuclear warmongering. The next protest is expected at the upcoming NATO summit in London in December 2019, which he is expected to attend. Trump is an existential threat to humanity and the planet and CND will continue to campaign against his policies.